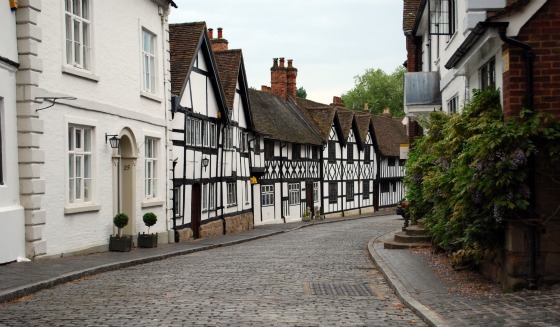 Around 20 minutes from Stratford is the picture postcard town of Warwick. The main attraction here is the castle (see our Warwick Castle page) but the town itself is certainly worth spending some time in. The streets are lined with attractive historic buildings and the shopping centre has quaint tea rooms and cafes. You’ll also find the Warwickshire Museum in the Market Hall. This is an extract from our free Shakespeare Country Guide. 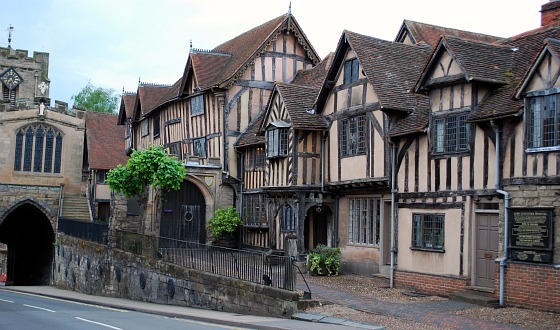 The Lord Leycester Hospital – Pictured at the top of this page. It’s never been a medical hospital though, instead since the time of Elizabeth I it’s been a place of retirement for old warriors and their wives. 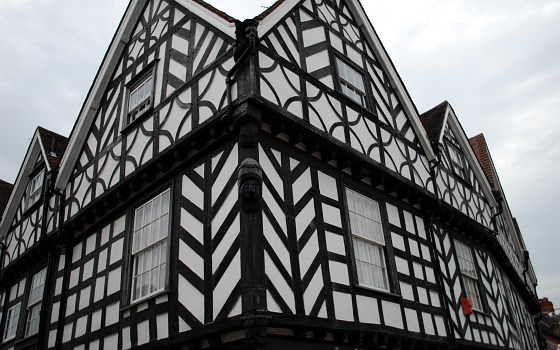 The buildings date from the 14th century and it is open to the public Tuesday to Sunday from 10am. We just admired the buildings from the outside, but if you want to go in, adult admission is £4.90 (2011 prices). 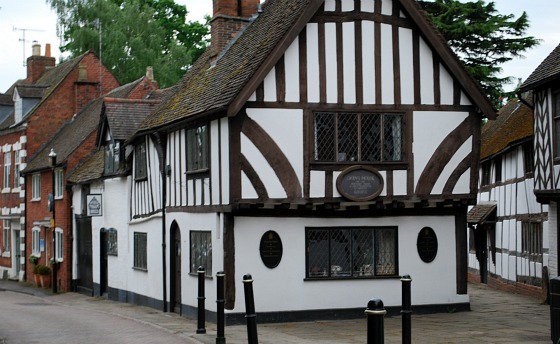 Oken House – Dating back 500 years, this was the house of Thomas Oken (pictured above). He was the richest man in Warwick at the time! His house is now a traditional tea room near the castle. St Mary’s Church – People have worshipped on this site for over 1000 years and today’s church is well worth seeing with it’s tower dominating the town centre. The church is open every day from 10am until 6pm in the summer and until 4.30pm in the winter. 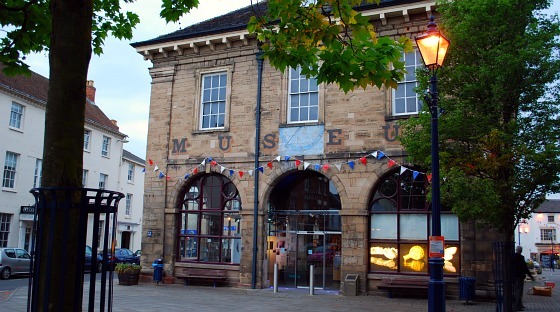 Museum – Another of Warwick’s historic buildings, the old Market Hall, now houses a musuem. Admission is free. Open Tuesday to Saturday from 10am until 5pm and on Sundays from 11.30pm unitl 5pm. Above the shops – Warwick has a traditional shopping centre with established high street names alongside the more unusual local shops. Whenever you’re in the shopping area though, don’t forget to look above the shop frontage because many of the shops are housed in very old buildings. A card shop and a mobile phone shop are below the impressive black and white structure pictured above.